These very light mat shades are flattering highlighters for older women ( not that we can’t use shine, but that is for another lesson). My favorite of the moment is the one that is used, its not yet up on www.beautyartmakeup.com. I think I shall call it “Reveal” so look out for it in the coming week. 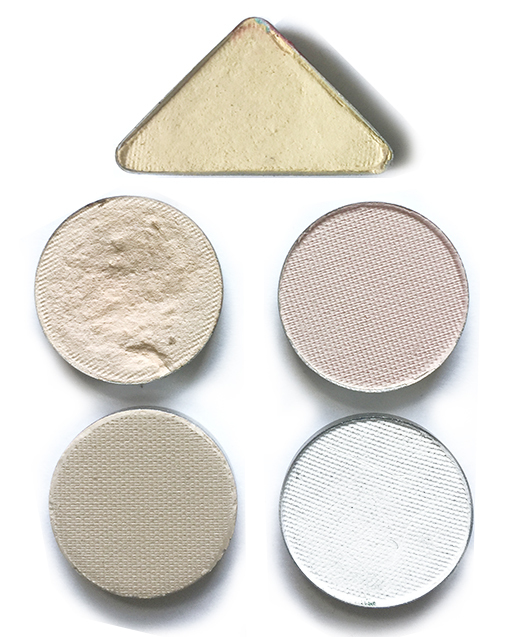 It is silky and although very lightweight it cancels out any redness on the lid without using concealer and brightens naturally the inner corners of the eyes.The one next to it with a pinkish hue I like to use as a highlighter on women with a more yellow skin tone as the contrast can brighten the eyes imperceptibly. I haven’t yet used the beige one on the lower left I somehow see it on a brunette or darker skin tone to give a natural highlight. The white next to it is also lightweight but harder and more difficult to apply , it needs a firmer brush something like the mini shadow brush. Its great worn with the cooler grey shadows. At the top is Ivory a long time favorite to highlight the eye, its good for women wanting something extremely delicate, that one too is a firmer shadow and needs a firmer brush to be able to get any product onto the eye. If for some reason you are having trouble getting the shadow onto the brush you may need to scratch the top of the shadow with a pin or your nail. Make sure that you never use your finger tips on the shadow the oil from the fingers creates a film making it harder for you to get any color. This entry was posted in About, Applications, Makeup, Makeup Artist, Minimasterpieces, Products, Tips, Tools and tagged eye makeup, eye makeup for older women, eye shadow, makeup brushes, older women. Bookmark the permalink.